Tonight's dinner was pretty much exactly what I planned, except for the group! I've been hoping to do more dinner nights at my house, and this one was born of a suggestion while out wine tasting on Sunday with Alexi that Mark and Bruce (from the winery we were at) should come hang out at my place and drink whisky. Once that idea came out, I realized we should also do pulled pork, since Bruce (Mark the winemaker's dad) and I have talked before about southern BBQ, especially South Carolina mustard-style sauces. So, I invited them over for pulled pork and whisky night, and they were going to check with Sam (Mark's wife) and Nancy (Bruce's). It turned out the women thought they and Mark and Sam's little girls would skip the outing, but the guys would come. I invited Alexi and her husband, and we were all set. Also invited a couple more friends on Monday, but they finally bagged late last night, and then first thing this morning, Mark texted to say he'd had a seizure and they weren't going to make it! Yikes! I had already made the pulled pork with the picnic roast from the half sow I'd gotten from a friend a few months ago, made mac & cheese on a whim last night after a suggestion on Facebook in the middle of my epic "rolls or cornbread" thread, had frozen shrimp defrosting for an appetizer as people arrived, and had a bag of cole slaw ready to mix up. So, I invited a few more folks (Alexi's hubby came even though Alexi couldn't) and four of us ended up having a really nice meal. I never got around to making corn bread, but we didn't miss it. 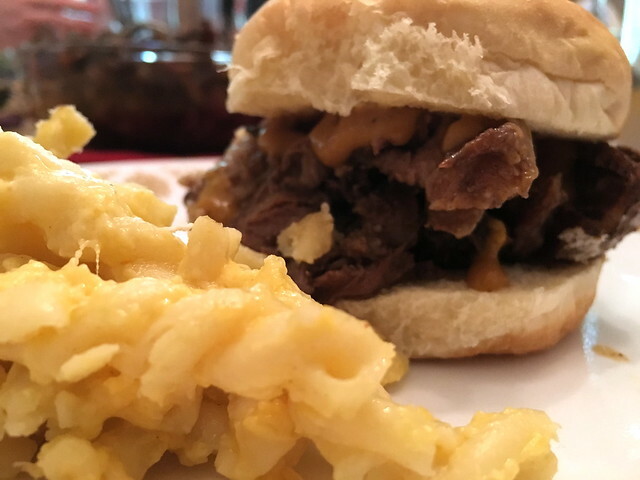 I had gotten a couple of types of rolls, small sweet Hawaiian-style rolls and potato rolls, and the mac & cheese, while a little dry, also did well next to the pulled pork. The South Carolina style rub I had used in making the pork, and the SC-style sauce next to it, ended up perfect!